This page, Plants Toxic to Dogs Page 2 is a continuation of our list of those flowers and plants that dogs should never sample. With over 700 plants toxic to dogs, it’s hard to know how to protect your vulnerable little dog. We produced a list of common indoor and outdoor plants that many folks grow and enjoy. Knowing which plants can make your dog sick or worse is important to your peace of mind and your dog's safety. 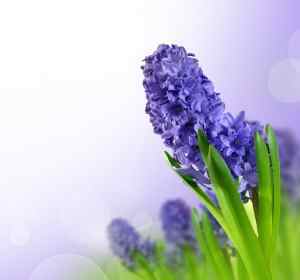 Even if you do not have a garden or care for indoor plants, many fresh bouquets of flowers include ones that can be poisonous. Watch puppies especially as they like to nibble on anything novel. 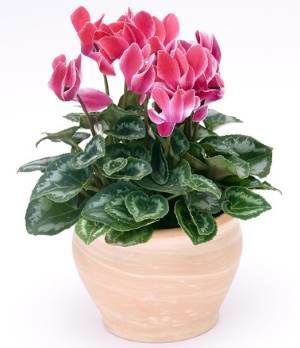 Cyclamen or Sowbread is a beautiful flowering plant that is toxic to dogs and cats. Grown indoors as a house plant or outside as a garden plant, the roots of these plants can be deadly. If ingested, this plant can cause increased salivation, vomiting and diarrhea. If an animal ingests a large amount of the plant’s tubers below the soil, they can suffer heart rhythm abnormalities, seizures and even death. I can’t image a dog eating these but puppies are attracted to these pretty flowers that remind us that spring is here. 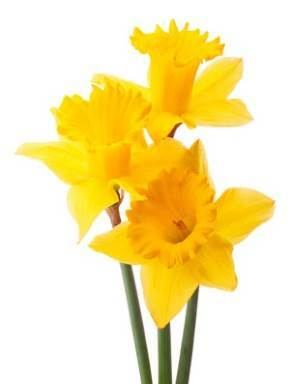 The flowers contain lycorine which is a substance that can trigger vomiting. The bulbs are the most dangerous. Ingesting the bulbs will cause vomiting, salivation, and diarrhea. If the dog ingests enough, it can cause convulsions, low blood pressure, tremors and heart arrhythmia. 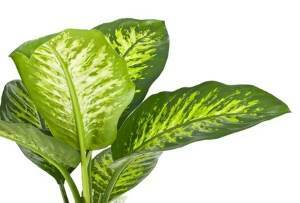 Dieffenbachia which is commonly called, Dumb Cane, Tropic Snow or Exotica is toxic to dogs and cats if ingested or even tasted. If the plant is ingested, oral irritation can occur, especially on the tongue and lips. This irritation can lead to increased salivation, vomiting and difficulty swallowing. 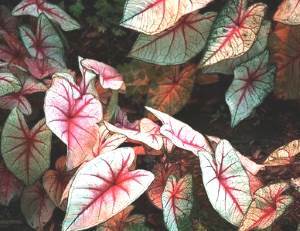 Elephant ear also called Caladium, contains a chemical similar to that in dieffenbachia. The toxic reaction to elephant ear is similar and includes oral irritation to the tongue and lips, increased salivation, and difficulty swallowing and vomiting. The red berries may be attractive to your dog and they are poisonous, but so is the bark, leaves and seeds. 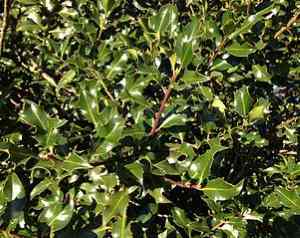 The poison found in holly is theobromine, an alkaloid similar to caffeine. 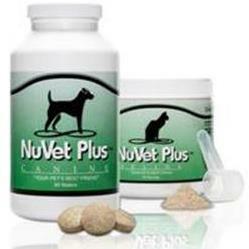 This toxin is also found in chocolate, another food that dogs should not eat. Ingesting this plant can cause diarrhea, vomiting and depression. 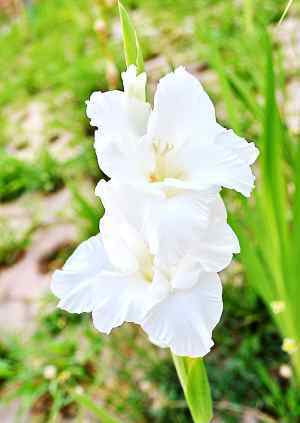 Many people grow these in the garden and they also make a popular choice in floral arrangements. The bulb is the most toxic to dogs and if eaten will cause salivation, vomiting, drooling, lethargy and diarrhea. The moral of the story: Don’t let your dog help you plant those bulbs! 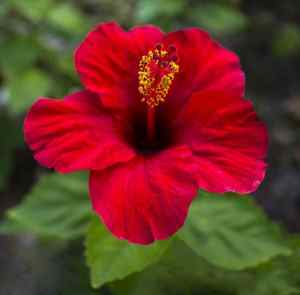 Also known as the Rose of Sharon, this lovely flower is on our list of plants toxic to dogs. The toxic principles are unknown, but if ingested, the dog can experience gastrointestinal symptoms such as loss of appetite, nausea, vomiting and diarrhea. If symptoms are severe, dehydration can occur and you should take your dog to the veterinarian for treatment. 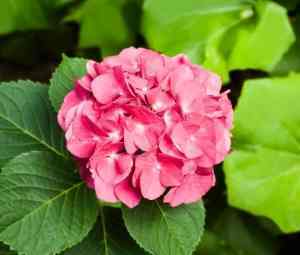 These plants are very common and make a perfect addition to a shaded garden. Most dogs do not bother these plants, but if yours is an exception, it is toxic and can cause vomiting, diarrhea and depression. This lovely spring flower is not highly toxic to dogs, although ingesting them can lead to oral and esophageal tissue inflammation. Depending on the amount a dog consumes, symptoms can include profuse drooling, vomiting and diarrhea. There is no known antidote. The highest toxicity is concentrated in the bulbs, which dogs obtain by digging in the yard or raiding a bulb awaiting planting. When a dog eats a large amount of a bulb, she may experience serious changes in heart rate and respiration, which need the immediate attention of a veterinarian. These beautiful flowers grow on a bush and change color depending on the type of soil they are grown in. While beautiful to look at, your dog should not try to nibble on the plant. They aren't one of the more toxic plants, but can cause gastrointestinal upset including diarrhea, vomiting, and lethargy. 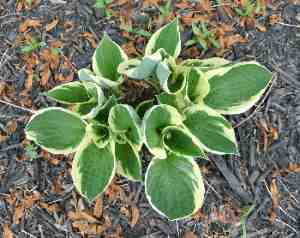 If this plant grows in your garden, just keep an eye on your dog. This is only a small list of plants toxic to dogs. 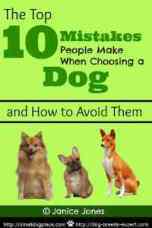 For more information, the ASPCA website offers a much more comprehensive list. If you think your dog has eaten something he should not have, call your veterinarian. Two poison control organizations that are helpful and are available to you 24/7 are the Animal Poison Control Center (1-888-426-4435) and the Pet Poison Helpline (1-800-213-6680).